Skate at Somerset House is back (starting on the 14th of November) and I'm so excited for all the different ice-skating venues to pop-up in London. A few years back, John, Udita, and I skated at the Tower of London, which was a lot of fun. You're given an hour on the ice and yeah, it can get kind of crowded depending on what time you go, but it's such a beautiful atmosphere to whizz around in (or in my case, fall over repeatedly while clutching onto the barriers - let's not kid ourselves here) and it makes me feel all ... dare I say it ... Christmassy. Having a cup of hot mulled wine afterwards does just the trick. 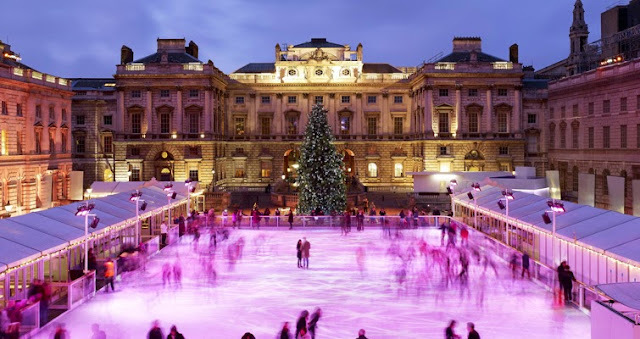 But skating at Somerset House has a lot of personal significance for me as well: eight years ago, on the weekend of my 22nd birthday, John bought last-minute tickets for me to fly out and meet him in London, where he was interning at the time. I was in the middle of my senior year at MHC and remember telling one of my professors that I wouldn't make it to tutorial on Friday because I was taking a weekend trip to London. It only sounds preposterous to me now, but it certainly didn't at the time! Udita borrowed our friend Dory's car, drove me to Boston Logan Airport at 4:30 a.m. (we also had an incident where the hood flipped up halfway down the Mass Pike, we both screamed, had to pull over, and couldn't shut the hood until I slammed it down in frustration - then it stuck) and drove back to take a Neuroscience exam at 8 a.m. What a friend, right? When I landed at Heathrow, I remember being so happy to see John but also being so, so sad that our weekend together was so short. He was living in Stoke Newington at the time (not far from where we're living now, funnily enough) and I even remember taking the 243 with him into Central London (which I regularly take now), where he surprised me with tickets to Skate at Somerset House. There's a picture of us floating around somewhere taken on Jubilee Bridge that evening, post-skate, and our faces are pressed together, grinning into the camera. We look so inexplicably happy; in fact, it's one of the few moments I remember being happy during that year - the rest of it was marked with a cold, dark Massachusetts winter that seemed to last forever, and lots of sadness at being apart. Right before I left for Boston, John gave me a small box, containing a necklace with a small, solitaire diamond. I put it on immediately and have never taken it off. When I saw Kara this summer for our wedding reception, she mentioned how happy she was to see me wearing it because she remembered how excited I was when I came back from London during our senior year, having just seen John. So, though Somerset House's skating rink might be the last place you find me this winter because of my severe lack of balancing-on-the-ice skills, I can't help but get excited every time it's advertised because it reminds me of our weekend in London all those years ago and how it's important not to take these things - these moments - for granted.